Hard apple cider is hot, but what about perry? Pears are also turned into hard cider, called perry in the U.K.; but perry is not as well known in the U.S.
American cider makers tend to label their perries as pear cider. And there are far fewer of them. We’ve had all of Angry Orchard’s 13 apple ciders, but these days it’s their one perry—a.k.a. Orchard’s Edge Knotty Pear—that has our attention. It’s available nationwide, and will open your eyes to the joys of pear hard cider. 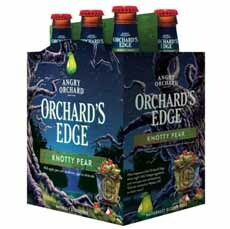 We need for more American cider lovers to try it and convince Angry Orchard that there is a market for more perry. The term perry comes from the Old French word for pear, peré (PEH-ray), from the Latin word for pear, pirum. As with apples, the pear varieties used to make cider tend to be sour, and aren’t pleasant eating. Next step: Look for Knotty Pear cider and buy it. If you find several brands, buy them all and have a perry tasting. Discover more about Angry Orchard ciders. We’ve tried caffeine-free coffee substitutes: Thanks but no thanks. But Coffig has succeeded in making a natural coffee alternative from roasted figs. We didn’t believe it until we tried it. It really does substitute for coffee, hot or iced. If you’re looking for an alternative, try it. We think you’ll like it. And there’s a 100% Money Back Customer Satisfaction Guarantee if you don’t. Coffig comes in convenient, individually wrapped “tea bags” for single cups; as well as in pouches of powder for making larger batches. The product is 100% roasted black figs. You can buy them on the website: Coffig.com, and on Amazon. In 2014, Samuel Adams introduced Rebel IPA, their take on a West Coast IPA (India Pale Ale). West Coast-style IPAs use hops from the Pacific Northwest, which have different flavors than European hops, and generally have more hop intensity. We liked Rebel IPA. So did a lot of other people. It did so well in these IPA-happy times that siblings began to arrive: Rebel Rouser Double IPA, Rebel Rider Session IPA, Rebel Juiced IPA, Rebel White Citra IPA and our favorite, Rebel Grapefruit IPA. We are fans of wines with grapefruit notes, like French Sauvignon Blancs, and love it in beer, too. 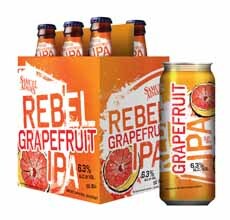 Rebel Grapefruit IPA is brewed with real grapefruit in the mash, for a prominence of flavor that complements the citrus of the hops. See it, try it. Find details at SamuelAdams.com. Find more beer types and terms in our Beer Glossary. First came coconut water, then maple water, and now birch water. 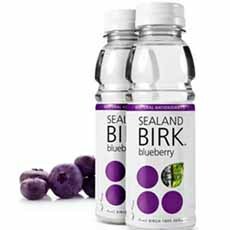 The producer, Sealand Birk (birk is Danish for birch), advises: Drink your water from a tree—just like the Vikings used to…the people of the Nordic regions rejuvenate their body and soul after long, harsh winters with the uplifting spring tonic of birch tree water. Birch water has become “the detox ingredient de jour” thanks to its antioxidant- and mineral-rich nutrient profile. It won the drink category of the 2016 Nature & Health Natural Food Awards. We had the opportunity to drink the line at a trade show, and proclaimed every flavor (blueberry, cranberry, elderflower, gooseberry, mango, raspberry rhubarb) and the unflavored original winners. So where can you buy it? Write to info@sealandbirk.com with your zip code. Knotty Pear from Angry Orchard is a perry: pear cider (photo courtesy Angry Orchard). 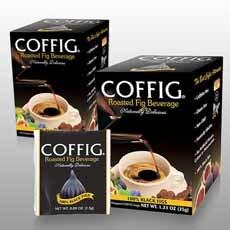 Coffig is a coffee substitute made from figs (photo Pinterest). Our new favorite beer from Samuel Adams: Rebel Grapefruit IPA (photo Boston Brewery). Refreshing, nutritious water tapped from birch trees, available plain or flavored (photo Sealand Birk). Sprite’s first new entry in 56 years: Cherry Sprite (photo Coca-Cola). Hopefully they’re coming soon. You can ask to be emailed when they arrive. The company’s main website is based in Australia, and has e-commerce; but the U.S. website currently does not. Otherwise, you may just have to tap a birch tree. One could do worse than be a tapper of birches. Lemon-lime Sprite was introduced to the U.S. in 1961 as a competitor to 7 Up. Why has it taken this long to come up with a line extension, Cherry Sprite? The answer is vending machine technology; specifically, Coca-Cola Freestyle, the touch screen soda fountain that has changed drink dispensing in movie theaters and other soda-thirsty locations. The machine features 165 different variations of Coca-Cola products: Coke, Diet Coke, Dr. Pepper, Sprite and the company’s other brands. Consumers can add flavors to their base drink of choice. Upon review of purchase data, cherry was the number-one flavor added to Sprite. Thus, you can now buy Sprite Cherry and Sprite Cherry Zero in 20-ounce bottles in stores nationwide. The new flavor was a long time coming, but worth the wait. Theatre fans note: Formulations for the Freestyle dispenser and the bottled versions of Sprite Cherry and Sprite Cherry Zero vary a bit. 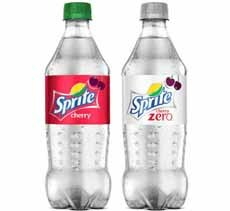 The most obvious difference is that Sprite with added cherry flavor from the Freestyle produces a red-tinted drink, whereas bottled Sprite Cherry and Sprite Cherry Zero is clear. And LeBron James drinks it. See him at Sprite.com.